Generous sponsorship from Dunrobin Castle allowed Golspie Golf Club to reward the two principle winners of the 36 hole Millicent Bowl Open tournament with prize vouchers to the value of £250 each. The Castle, the Dukes of Sutherland and their heirs have had a long connection with the local golf club and it was a family relative, the Earl of Rosslyn, who, in 1963, gifted the competition's handicap trophy to the golf club in affection of his great aunt, Millicent, Duchess of Sutherland. Many of the winners have, over the past 55 years, been Golspie local teenagers when developing their golf on the Golspie course . Following in their footsteps the new name added to the affectionately known Millicent Bowl this year was current top club junior Danny Doogan, aged just 15. After 1963, when the event was growing in stature, the suggestion of a scratch trophy was put forward by the late local fishmonger, Alick Campbell, and the trophy now awarded for the leading scratch aggregate is the Campbell Shield. 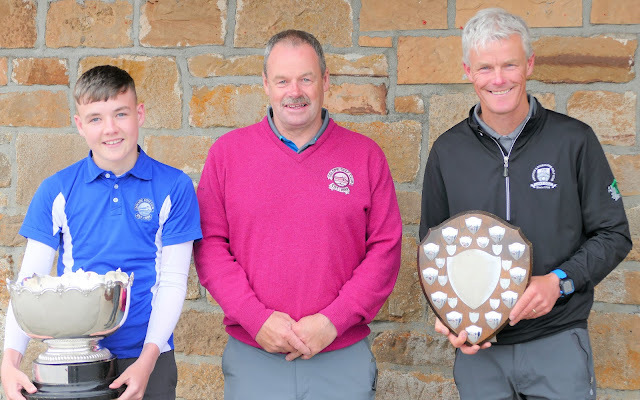 The winner it was awarded at the weekend tournament, George Paterson, is no stranger to the Golspie links, being one of the few to have won the Sinclair Cup in the August tournament three years in succession: 1992, 1993 and 1994, long before the bowl winner was born. George Paterson (51) was serving a greenkeeping apprenticeship on the Fortrose and Rosemarkie golf course when he was winning the Sinclair Cup but after spells in Ireland and Moray he returned to the Black Isle course last year as its head greenkeeper. With the help of a hole-in-one on Golspie's 10th hole, “The Lochy” 140 yards, with a seven iron, he posted a first round one under par 69. Paterson's level par 69 (36/33) was matched by last year's scratch winner, John Forbes (Inverness), and closely followed by the reigning Sutherland county champion, Chris Mailley (Royal Dornoch), making his first tournament appearance following a shoulder injury. Mailley opened with a 71 and local lefty Darren Hexley was in the mix with a 72. Conditions toughened in the afternoon and Forbes and Mailley struggled and fell from contention with 80 and 79 respectively. Paterson fell back to a 76 (37/39), three three-putts, and three bogeys over the closing four holes but his 36 hole gross of 145 held first place by two shots over Hexley, 147 (72/75), and into third place arrived Dornoch college student Graham Minton (Greenock) 75/74 149. But the most consistent scoring of the day was from young Doogan, two gross 75s and from an ever-improving handicap of seven. His net 136 aggregate lifted the Millicent Bowl by two from clubmate and last year's winner, Colin Sutherland, who had net cards of 72 and 66 for 138. The third place voucher was won another local, Colin “Scooty” Sutherland, with netb scores if 69 and 72 for 141 off 5. The golf course hosted a following day's Texas Scramble and Golspie club captain William MacBeath enlisted two of Saturday's prize winners to lift his team of Danny Doogan, Scooty Sutherland and Danny's father, Steve, to first place with a gross card of 59 (net 56.6). Second place vouchers were won by the Alness Golf Club members, Shaun McKinlay, Scott Sutherland, Sean Doull and Campbell Jamieson with a return of 63, nett58.